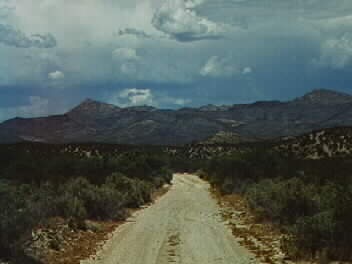 The old military road used by the U.S. Cavalry from Camp Goodwin (later Ft. Thomas) to Ft. Apache is still used as a reservation road. This is a view of the road near the Gila River near modern-day Bylas, not far from the Old San Carlos Subagency. Over this road traveled many famous people in Arizona history: Cochise, Geronimo, General George Crook, many. Historians also believe that the conquistador Francisco de Coronado also passed over this area in 1540 on his way to the Seven Cities of Cíbola.